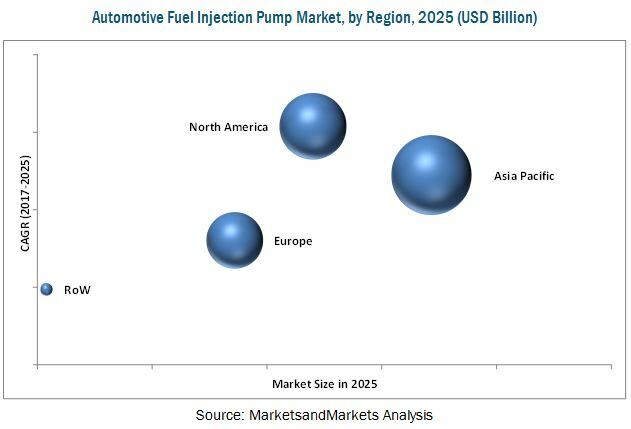 [140 Pages Report] The automotive fuel injection pump market is estimated to be USD 19.25 Billion in 2016 and is projected to grow at a CAGR of 7.8% from 2017 to reach USD 38.20 Billion by 2025. In this study, 2016 has been considered the base year, and 2017–2025 the forecast period, for estimating the size of the automotive fuel injection pump market. The report analyzes and forecasts the market size value (USD million) of the automotive fuel injection pump market. The report segments the fuel injection pump market and forecasts its size, on the basis of region, vehicle type, type, application, and pressure. The report also provides a detailed analysis of various forces acting in the market, including drivers, restraints, opportunities, and challenges. It strategically profiles key players and comprehensively analyzes their market shares and core competencies. It also tracks and analyzes competitive developments such as joint ventures, mergers & acquisitions, new product launches, expansions, and other activities carried out by key industry participants. The research methodology used in the report involves various secondary sources such as Automotive Component manufacturers Association (ACMA), Asociacion Mexicana de la Industria Automotriz (AMIA - Mexican Association of the Automotive Industry), China Association of Automobile Manufacturers (CAAM), Environmental Protection Agency (EPA), International Organization of Motor Vehicle Manufacturers (OICA), National Highway Traffic Safety Administration (NHTSA), Japan Automobile Manufacturers Association (JAMA), European Automobile Manufacturers Association (EAMA), Canadian Automobile Association (CAA), and Korea Automobile Manufacturers Association (KAMA). Experts from related industries and automotive fuel injection pump vendors have been interviewed to understand the future trends of the automotive fuel injection pump market. The market size of the individual segments was determined through various secondary sources such as industry associations, white papers, and journals. The vendor offerings were also taken into consideration to determine the market segmentation. The bottom-up approach has been used to estimate and validate the size of the global automotive fuel injection pump market. The data triangulation and market breakdown procedures were employed to complete the overall market engineering process and arrive at the exact statistics for all the segments and sub-segments. The ecosystem of the automotive fuel injection pump market consists of manufacturers such as Continental (Germany), Delphi (UK), Robert Bosch (Germany), and Denso (Japan) and research institutes such as Japan Automobile Manufacturers Association (JAMA), European Automobile Manufacturers Association (EAMA), Canadian Automobile Association (CAA), and Korea Automobile Manufacturers Association (KAMA). The global automotive fuel injection pump market, by value, is projected to reach USD 38.20 Billion by 2025 from USD 20.91 Billion in 2017, at a CAGR of 7.8% from 2017 to 2025. Some of the major drivers identified are increase in demand for fuel-efficient vehicles and stringent emission norms implemented by the government regulatory bodies supporting fuel injection pump with advanced technology in vehicle engines. The global automotive fuel injection pump market is segmented by pump type, application type, vehicle type, pressure, and region. The report discusses two types of pumps, namely, common rail fuel injection pump and rotary distributor fuel injection pump. The common rail fuel injection pump market accounted for the largest market shares in the global automotive fuel injection pump market and is projected to grow at the highest CAGR during the forecast period. The growth of common rail fuel injection pump is expected to be driven by increasing demand for improved vehicle performance and constant pressure throughout irrespective of the engine speed & load conditions. Also, to understand the type of application, the report discusses the market for automotive fuel injection pump under two distinctive types of fuel systems, namely, direct injection system and multipoint fuel injection system. Further, to understand the market in different vehicle segments, the market is segmented into passenger car (PC), light commercial vehicle (LCV), and heavy commercial vehicle (HCV), and by pressure into low pressure pump and high pressure pump. The extensive study has been done on four key regions, namely, Asia Pacific, Europe, North America, and the Rest of the World (RoW). The automotive fuel injection pump market for direct injection system is estimated to account for the largest shares estimated in 2017. Various automotive OEMs, especially in North America, are offering direct injection system in their vehicles irrespective of the type of fuel. The use of direct injection system is increasing in gasoline engines to increase the vehicle performance and fuel efficiency. OEMs such as General Motors (US), Daimler (Germany), Volvo (Sweden), and Volkswagen AG (Germany) provide direct injection system in their vehicle models. Asia Pacific is estimated to account for the largest market share, followed by North America, Europe, and Rest of the World (RoW), respectively. 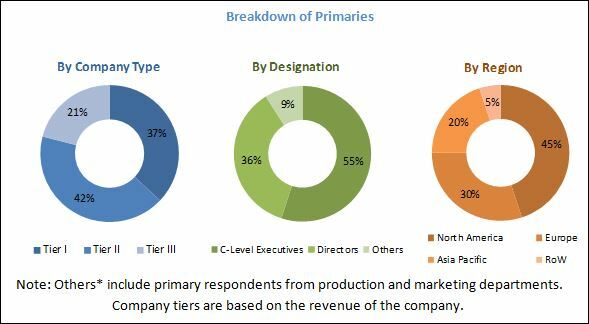 Asia Pacific is anticipated to remain predominant during the forecast period due to various factors such as increase in automotive production, the current nascent stage of the market, state-promoted support, and cost advantages for OEMs. In terms of growth rate, North America is estimated to exhibit the highest CAGR during the forecast period. The growth in North America is anticipated to be driven by increasing penetration of direct injection system in vehicles driven by gasoline engines. Some of the major restraints identified in the global automotive fuel injection pump market is the increase in penetration of electric vehicle and support of government to it due to environmental concerns. As of 2017, increase in the cost of electrification of automotive fuel injection pump may pose a challenge for the growth of the market to some extent. Some of the major players in the global automotive fuel injection pump market are Robert Bosch (Germany), Continental (Germany), Denso (Japan), and Delphi (UK). The last chapter of this report covers a comprehensive study of the key vendors operating in the automotive fuel injection pump market. The competitive landscape is presented as a SWOT analysis of the leading players. The evaluation of market players is done by considering various factors such as new product development, R&D expenditure, business strategies, product revenue, and organic and inorganic growth. *Details on Business Overview, Products Offered, Developments, SWOT Analysis, MnM View Might Not Be Captured in Case of Unlisted Companies.